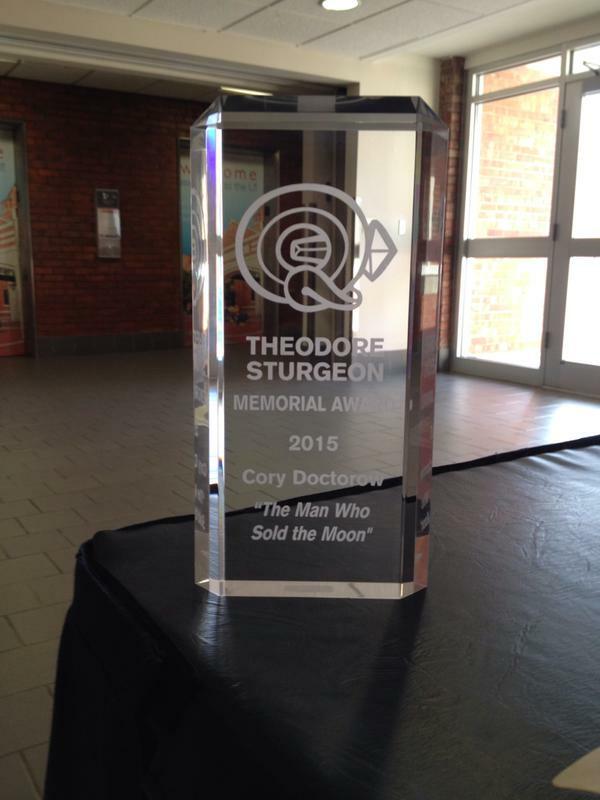 Cory Doctorow’s “The Man Who Sold the Moon” is the winner of the 2015 Sturgeon Memorial Award for the best short science fiction of 2014. The award was presented at the Campbell Conference in Lawrence, KS on June 12 and accepted on Doctorow’s behalf by Joey Eschrich. The winning story appeared in the anthology Hieroglyph: Stories and Visions for a Better Future edited by Ed Finn and Kathryn Cramer. This entry was posted in Awards and tagged Cory Doctorow, Theodore Sturgeon Memorial Award by Mike Glyer. Bookmark the permalink. One of the cool things about the Campbell and Sturgeon Awards is that they usually announce runners-up as well. Important consolation prizes for those who narrowly missed out! That’s odd, I don’t see the runner[s]/up either. Comparing it with the nominations for both the Nebs and Hugos is enlightening. As with most of the stories in Heiroglyph, this was good, but has not stuck with me. The book is well-worth buying, I hasten to add, and if you purchase the efile, follow the links to the story genesis discussions. That’s some interesting stuff. Finishing in the top three is an honor in itself, because the Campbell and Sturgeon Awards have only one winner, without category divisions. As one of the nominators, I usually receive notification right away, so I’m a bit surprised not to see it.